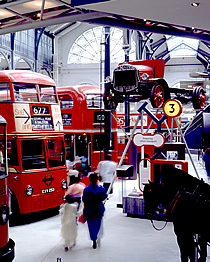 The London Transport Museum is a wonderful museum celebrating London's transport past and present. With over 80 rail and road vehicles, the museum has wide array of modes of transport. Housed inside a glass Victorian building, the museum was previously a fruit and vegetable market, part of the market area in Covent Garden and also a flower market. It presents the history of London's transport, including buses, trams and the underground. It explains how due to London's transport network, the suburbs of London flourished. Uncover the stories behind the many stunning works of art seen in London's train stations in the Museum's newest exhibition.